Collaborating since 1999, we are a network of organizations and individuals we bring to the forefront meaningful, thoughtful and sensitive conversations on improving care and support for those with serious illness. We are viewed as a thought leader working to ensure that every individual has the right to quality care throughout their lives, especially at the end of life. We advocate for quality palliative and hospice care within the medical and legislative communities in Hawaii. Our goal is to create a community in which advance care planning conversations are the norm. We are fostering a movement to change social norms in Hawai‘i regarding conversations and decisions around serious illness and end-of-life care, and to provide all individuals and communities with greater choice and control regarding their quality of life. We do not focus on the end of life, but rather the quality of life. Advance care planning can take place years before an illness or crisis occurs and is the first part of the continuum of planning for one’s legacy wishes. We hope that you will find useful Hawaii-focused information and resources on hospice, palliative care, end-of-life care, POLST and Advance Care Planning for yourself, your loved ones and those you care for. In our Tool Kit you find all Kōkua Mau materials (as PDF files) in one place are. SB 804 was heard March 28 by the House Finance Committee and 3/20 by the House Consumer Protection and Commerce Committee. It was had been heard by the House Committee on Health on Tuesday 3/11. Initially it was heard 2/25 by the Senate’s Ways and Means Committee and was approved to move forward and cross over to the House. HB 1447 was heard 2/26 by the House Finance Committee and was approved to crossover to the Senate. It has not yet been scheduled to be heard by the Senate. The Our Care, Our Choice Act (OCOCA) is a Hawaii law that permits terminally ill adult patients with the capacity to make medical decisions and who meet certain other conditions to be prescribed an aid-in-dying medication. The law went into effect on January 1, 2019. Hawaii is the seventh jurisdiction to enact such a law. Kōkua Mau created a webpage with an overview of the Our Care, Our Choice Act, including information for patients and families and Frequently Asked Questions for Providers. Kōkua Mau is a neutral source for information on the new law. All workshops on Moloka‘i originally planned for September were rescheduled for December 13-15, 2018 due to Hurricane warnings. Our colleagues at the Coalition for Compassionate Care of California, a sister organization to Kōkua Mau, shared their experiences and suggestions as Hawai‘i moves towards a January 1, 2019 start date for our law. The laws are very similar and their experiences are very relevant. They shared data from the first two years, information on provider and community education as well as the experiences from a Kaiser physician that is assisting in implementing the law in their region. A link to the webinar recording. 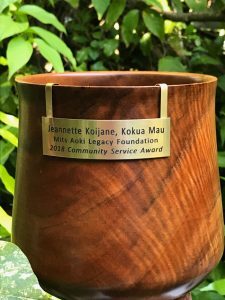 We are very pleased to announce that Kōkua Mau has been awarded a second year of funding for “Improving Care and Support for those with Serious Illness” from the Stupski Family Fund of the Hawaii Community Foundation. We are very grateful to the Stupski Family Fund for their vote of confidence in the work of Kōkua Mau. The grant allows us to build on the work that we collectively have accomplished over the last 18 years, and further expand our reach and impact across the state. We have heard from you, our members, and others in the community that there is a unfilled need for more advance care planning conversations to occur long before people develop a serious illness or are in a crisis. We will be using the grant to reach out to the community where people work, live and pray with the support of Hope Young, our Advance Care Planning Coordinator, and our Let’s Talk Story Program (Speakers Bureau). We contracted with Ward Research to conduct telephone surveys and focus groups of Hawaii residents to learn about their attitudes towards conversations with doctors, families and completion of advance care documents. This research was made possible with a grant from the Stupski Family Fund at the Hawaii Community Foundation. The results are very interesting, showing people in Hawaii are having conversations but there is a long way to go. More and PDF files of both reports. ⇒ Let’s Talk Story Program: Kōkua Mau wants to get our community talking about wishes for care at the end of life. Our new Let’s Talk Story Program – more – will go out to community organizations, churches and temples with our free, 2-hour interactive sessions facilitated by Kōkua Mau’s trained experts. Option 2 is a free screening of ‘Being Mortal’. By Language: Click on the language link for all resources available in that language. We will add selected materials in the language (such as the Conversation Starter Kit) when we become aware of it. By Document: Just click on the “multilingual” link for e.g. POLST and you find all the languages available for POLST on one webpage. We want to thank all the volunteers who have dedicated countless hours reviewing documents and giving us feedback. It has been a herculean task but our community project is finally a reality thanks to all of you that helped us with your expertise. Register here to receive free Kōkua Mau e-Newsletters with local and national updates and events. Kōkua Mau depends on donations and annual membership fees to carry on with our work. Please help us improve quality of life for people living with serious illness or at the end of life here in Hawaii. This is a community wide effort that needs everyone’s support.